Margaret is coming back to the Australia & the UK this fall! After finishing a stint on Dancing with the Stars and wrapping a third season on Drop Dead Diva, Margaret will be back at the Edinburgh Fringe Festival for the first time in 10 years with new stand-up and comedy songs from her 2011 Grammy-nominated album, Cho Dependent. After Edinburgh, she’ll be hitting Australia, London, Brighton and Glasgow! This will be the first time Margaret has returned to Australia since she was the Chief of the 2008 Mardi Gras parade! View a complete list of cities and ticket links on Margaret’s tour page, here. starts Monday, June 20 at 9am local – Thursday 23 June 5pm local. Join Margaret’s mailing list to get the password and presale links, before the shows go on sale to the general public on Friday, June 24 at 9am local. The email to fanclub members will go out next week! Drop Dead Diva Season 3 Premiere! I’m so excited that you’re touring to Australia! 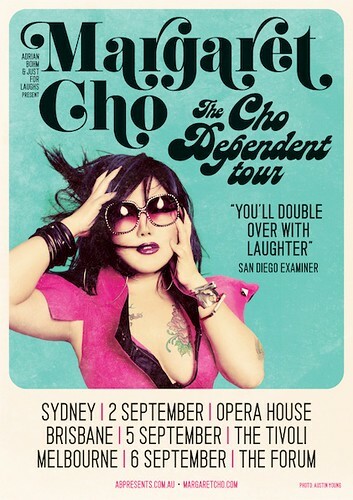 YAY I have been wanting to see The Cho live for years and hoped you would be back soon! I am so excited to be on the list for pre-sale (I just hope I get a ticket). You’re not coming to Adelaide 🙁 but all good I will go to Melbourne just for you. The question is do i go as a Cho Ho or AssMaster?…maybe both! Help… where’s the pre-sale link?? been looking since 9am… am easily confused…. Quality articles or reviews is the crucial to be a focus for the visitors to visit the web page, that’s what this website is providing.